J is for J'onn J'onzz. J'onn J'onzz, the Martian Manhunter, has been a key part of the Justice League for several decades. The lone survivor of a Martian Holocaust, he was transported to earth following a lab accident involving an earth scientist. From a powers standpoint, he is quite versatile, displaying many of the same abilities as Superman while adding other talents like shape shifting, invisibility, and telepathy/telekinesis. 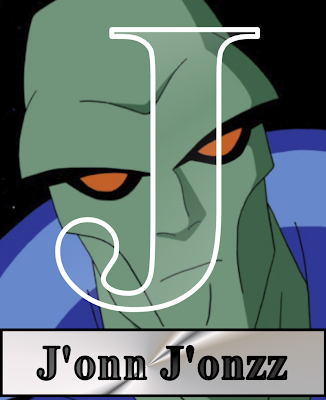 In the Justice League cartoon, Martian Manhunter is at the helm of the Watchtower, often providing operational support and information to other members of the League. Of course, he gets to mix it up every once in a while to show off his multiple abilities. A widower, J'onn J'onzz has a significant weakness in his fear of fire. Over the years, this weakness has taken the form of a true physical threat (i.e., fire is deadly to Martians as a race) and psychological one (i.e., fire paralyzes the hero's ability to think and perform his duties due to fire-related psychological trauma). Tomorrow: The Last Son of Krypton.